United Methodist bishops are offering prayer and comfort after Sewol, the ferry pictured, sank off the coast of South Korea. United Methodist bishops — including three Korean Americans — have extended prayers, words of comfort and the hope of Easter following last week’s ferry tragedy in South Korea. 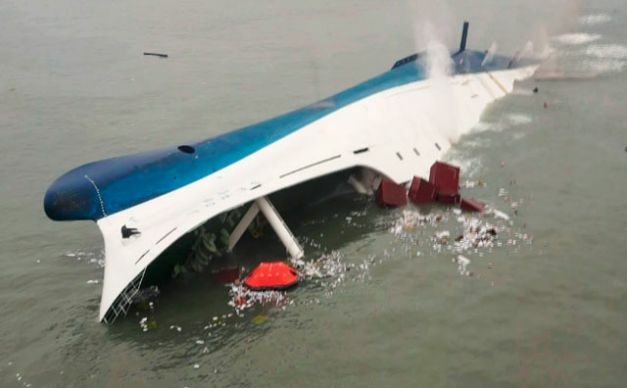 The Sewol ferry with 476 passengers aboard sank Wednesday, April 16, off the South Korean coast. According to news reports, the death toll has risen to at least 87 with more than 200 still missing — many of them high school students on a last excursion before a year of cramming for college entrance exams. “I know you are joining me in prayer for the families and friends in my native country of South Korea as we mourn the loss of so many lives following the terrible ferry accident,” wrote Wisconsin Area Bishop Hee-Soo Jung in an April 21 pastoral letter. He noted that the losses in South Korea have come not long after an airplane disappeared over the South Indian Ocean, leaving almost 300 families without clear answers of what happened to their loved ones. The bishop prayed not only for those who mourn but also for those involved in search and recovery efforts. But the tragedy has touched far more than the Korean and Korean-American community. A photograph of a grieving Korean woman made Chicago Area Bishop Sally Dyck think of Mary, the mother of Jesus, weeping for her crucified son. “The agony in her face is intense, and I see it as symbolic of the agony of all who are weeping today for the children and others on the ship that sank off the coast of South Korea,” Dyck wrote in a blog post. She said Michelangelo’s famous sculpture the Pietà, which shows a mourning Mary cradling Jesus, reminds her of how the Christian church should respond to tragedy. *Hahn is a multimedia news reporter for United Methodist News Service. Lee is the director of Korean resources for United Methodist Communications. Contact them at (615) 742-5470 or newsdesk@umcom.org.